The Zen of Hovering Helicopters. A really neat article about learning to fly, and very much on the money! How is flying a helicopter different than flying an airplane? Chopper 101 how fixed-wing pilots can predict what we rotorheads are likely to do! I am a rated pilot in both airplanes and helicopters. Last year I flew only something like 10 hours in airplanes. Which shows where my preference lies! July 10, 2005, taken by fellow rotorhead John. Helicopters are, well, something special. People ask me which is easier to fly, airplanes or helos. My answer is helicopters. Generally they don't believe me! I once asked a friend who has gobs of hours and is Airline Transport Pilot (ATP) rated in both, whether he thought my answer was because helicopters really are easier, or because I like them better. He said "Think about what you have to do to land an airplane... landing gear extension at the right speed, flaps extended at the right speed and in two or more increments, prop lever foward, mixture full rich, auxilliary fuel pump on, etc etc!" "Now think about what you have to do to land a helicopter. Slow down. That's about it! So which is easier?". Ever wonder how we manage to make helicopters do what we want them to? Let's talk about the controls. The pilot's left hand lightly cups a lever which looks a little like an old sports car parking brake lever, except it has a twist grip on it. This is the collective (more properly, the collective pitch control). It changes the pitch of all the main rotor blades. Pull it up, the helicopter goes up. Push it down, the helicopter goes down. Seems too easy, doesn't it? The pilot's feet rest on pedals which control the pitch of the tail rotor. In a hover if I push on the left pedal, the ship will spin to the left. That's how we do those turns you see on TV! The pedals serve one other very import function. If I raise the collective on the ground, the helicopter will start getting light on the skids. As it does so, it will also try to spin because I'm putting more and more torque into the main rotor system. 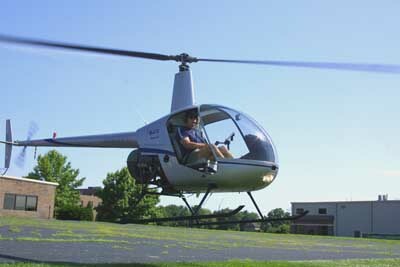 To stop the spin from happening, I have to (on U.S. helicopters) put in increasing amounts of left pedal as I raise the collective. The happens in all flight regimens -- pull up on collective, add left pedal. Lower the collective, increase right pedal (or decrease left pedal -- same difference). OK, so now we can get it off the ground without spinning, and we can make it turn. The pilot's right hands lightly holds the cyclic stick. This control, simply put, causes the rotor system to tilt in whichever direction the stick moves. Push it forward, you go forward. Push it back, you go backwards. Push it to the side and you fly sideways (which is kind of fun). In flight, right ot left cyclic causes the ship to bank and therefore turn.